It has been one year since our family made the decision to finally ditch cable once and for all. The rising cost of cable television was finally too much for our family to want to afford. It isn’t that we couldn’t afford cable … there was money in the budget … but rather we didn’t think the service was worth the cost. Those dollars that were being spent on cable could be used to buy assets … like dividend stocks … that could grow our net worth and earn us income. So how are we doing 1-year later after cutting the cord? Life hasn’t really changed since cutting our cable 1 year ago. As long as you have high speed internet … and a few streaming apps, you can pretty much watch most of your favorite shows. The only real issue that we found was watching live sporting events. We did have a subscription to Sling TV for 8 months, but dropped it last December. Sling TV is one way to still get ESPN and ESPN2, so you don’t miss your favorite games. For some reason, we always had problems streaming the service … even though we didn’t have issues with other services. It really became a hassle and we didn’t really watch too much on Sling TV, so we decided to cancel our service. At the time, the service cost $21.39 per month. We did manage a way to watch the Super Bowl … by using the FOX Sports 1 app. They provided coverage of the game for free. In addition, we added the CBS All Access service after we dropped Sling TV. This app will stream live television … so we were able to watch a few NFL games on CBS as well as several NCAA college basketball games. I think if you really try and search hard enough … you can probably find a way to watch most of the programs that you want – event sports. You just need to be flexible. 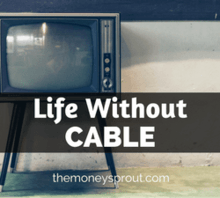 When we originally started out last May without cable … our total bill was $134.82 per month. This included our high speed internet along with the following services – Hulu, Netflix, and Sling TV. Once we dropped Sling TV, we decided to pick up the CBS All Access service for a much lower price. The last cable bill we paid back in April (2016) was about $205. Compare that to a new bill around $120 a month … and we are saving over $1,000 per year by dropping cable! Should You Drop Your Cable? Dropping our cable and switching to services like Netflix and Hulu took a few weeks to adjust to. But overall, I am glad we made the switch. Every month that goes by, we are saving almost $100 from what we had been paying for cable. And that is without any increases to our cable bill … which always seemed to happen. We have had a few glitches every now and then with shows freezing up on us. This doesn’t happen that frequently, but when it does we don’t really mind that much. I have a feeling these problems are more related to our WiFi and internet speed than anything. Each family is different, but you should be able to get most new television programs through a combination of Hulu and CBS All Access. Hulu offers most new shows, except for CBS programming for around $8 a month. Then if you like to watch CBS shows (like we do) … you will most likely need their services for under $7 a month. So for less than $15 per month (plus internet) … you can watch most shows that you can on cable. And don’t forget about Netflix too … although I will admit that we use that service the least for television shows. Did you make the switch from cable? How was your experience? What advice can you provide others looking to do the same?